Check box to "Allow upload on this Wi-Fi"
When first registering a Wi-Fi network, iSTAR Pulsar will automatically disconnect from the mobile device and attempt connection to the Wi-Fi network just specified, this allows users to confirm that the connection can be successfully established. A user may connect their mobile device to the same Wi-Fi network that iSTAR Pulsar is using, the mobile app will then after around a minute reconnect with iSTAR Pulsar and the user can continue monitoring/instructing the device. Note that in this state while iSTAR Pulsar will connect to the Wi-Fi network, no data will be transferred - a user must still move the mode switch to the Left in order for the unit to search for and install any available firmware updates, and to upload to VR.World any queued captures. 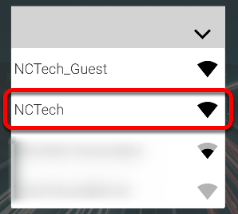 The Wi-Fi network added is now the default one for the device to use. Users may register multiple networks for this purpose, which will be utilised in order of most recent added.